Please join me in welcoming author Michelle Richmond to Musings of a Bookish Kitty! 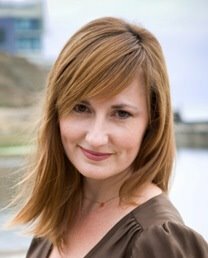 Michelle is the author of No One You Know, the New York Times bestseller The Year of Fog, the award-winning story collection The Girl in the Fall-Away Dress, and the novel Dream of the Blue Room, which was a finalist for the Northern California Book Award. 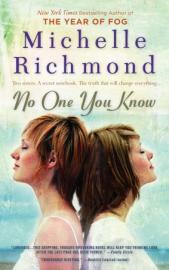 I recently read and thoroughly enjoyed No One You Know. Be sure and read my review if have not already. I would like to extend my heartfelt thanks to Michelle for stopping by! Not long ago, I was sitting with my son Oscar in the loft of his preschool, telling him a story, when he interrupted me to ask, "Where did that story come from?" "I just thought of it," I said. He was not satisfied. "But where did it come from?" "From my imagination," I said. "In my mind," I said. Oscar's question is a variation of the same one I heard again and again from graduate students during my years teaching creative writing, the same question I hear every time I do a reading or visit a book club: where do stories begin? I imagine every writer would have a different answer. For most, it involves some kind of percolation. Something occurs to you in the shower, or during a walk, or while down in the garage doing laundry. Days later, or weeks or months later, that original idea surfaces in the mind, and something else is layered on top of it. If the idea seems urgent enough, you get yourself to the notebook or the computer and write it down. It is possible to go for months of creative drought, but I've learned not to get too discouraged. Humans are born storytellers. I always trust that something will come; eventually, I'll find my story. When I'm feeling particularly uninspired, I try to find something mind-blowing to read. Sometimes, if I am very fortunate, I happen upon a book or essay that jogs my imagination--or, as Oscar would say, my magic nation--something that loosens the rust around the synapses and gets a story moving. A couple of years ago, I was about fifty pages into the novel that would become No One You Know. I had a basic plot, and a melange of ideas around which to construct the story. I knew, for example, that I was interested in the fine line between fact and fiction, the way stories shape our lives. I knew that I wanted to capture the spirit of San Francisco, my adopted home, the place that had inspired The Year of Fog. I knew that the story would be told by Ellie Enderlin, a coffee buyer in her mid-thirties who had lost her sister Lila--a math prodigy at Stanford--to violent crime twenty years before. Lila's murder was sensationalized in a true crime book written by Ellie's English professor, whose version of events derailed the life and career of a mathematician named Peter McConnell, with whom Lila had been working to solve a centuries-old mathematical puzzle. Read the first chapter here. During this time, I had lunch in North Beach with a writer friend and teaching colleague--Juvenal Acosta. We got to talking about our favorite books. Juvenal had high praise for Graham Green's The End of the Affair, and couldn't believe I'd never read it. I went right out and checked the book out from the library; six months later it was still sitting in my office, full of post-it notes. Eventually I returned it, paid the fine, and bought my own copy. It is one of the most bedraggled books I own. Bedragglement is evidence of a book's high standing in a person's life. A book that has been well-loved bears the marks. The End of the Affair is the story of a love affair gone wrong, with the mystery of the beloved's death front and center, but it's also a book about writing, about finding one's story and figuring out the best way to tell it. Like most novels, No One You Know grew out of several ideas that had been percolating over a period of time. But ultimately, it was The End of the Affair that provided the opening impulse for the book. 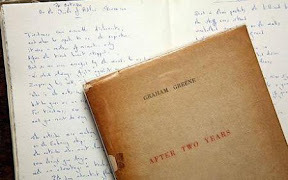 Greene's novel begins with the line, "A story has no beginning and no end. Arbitrarily one chooses the moment from which to look back or from which to look ahead." Twenty years after the tragedy that has defined her life, Ellie must decide for herself, as we all must, where her story truly begins. 1. Leave a comment on this post along with the title of a book that has inspired you. 2. Be sure to include your e-mail address if it is not easy to locate on your blog or profile page. 3. The deadline to enter is June 6 at 11:59 p.m.
4. This drawing is only open to those in the U.S.A. and Canada. Those of you outside of the designated countries, do not despair! I have an extra copy of No One You Know in my possession that I am willing to giveaway to someone outside of the U.S.A. and Canada. Same rules apply as above: leave a comment along with a title of a book that has inspired you, include your e-mail address, and sign up before 11:59 p.m. on June 6th. The winners will be chosen in a random drawing and notified by e-mail. Good luck! A title of a book that has inspired me? Wow. That's a hard one. I guess 90 Minutes in Heaven. Please enter me. Thanks for willing to send your copy internationally Wendy. I've heard all nice things about this book. Please enter me. A book that inspired me? I really don't know. But I do remember reading this book called Do They Hear You When You Cry by Fauziya Kassindja. It really opned my eyes to female circumcision and refugee issues. I did a lot of research after that and I really want to do something to help. Maybe someday I will. That book in a way was an inspiration. I LOVE reading about what inspires authors. I need to know inspiration when I see it, you know, so I can take advantage! An inspirational name of a book? That is hard! The first one that came to mind, though, was a book reviewed awhile back by CB James called "Send Me". I love that title. It is simple but can mean a thousand things. But given a chance, I'm sure I could come up with fifty more! How do I pick just one? Wow that is a tough question....I know that it might sound weird but I just did a persuasive speech to a class of 5th graders yesterday on the book that made me the reader that I am today...Charlotte's Web. It inspired me to read, to go somewhere in my imagination, it gave me courage to pick up another book and continue on with my reading journey. My 2nd grade teacher gave me her copy because I recited from memory the first 2 chapters to her, just to prove how much I loved this book. She believed in me! Please enter me in this draw. The book that most inspired me was 'As I Walked Out One Midsummer Morning' by Laurie Lee. I read this book when it was published in 1969 and I was so inspired that I followed in Laurie Lee's footsteps when I travelled through Spain in 1973. Pillars of the Earth by Ken Follett inspired me. Thanks for the great author visit and a chance to win the book. Please enter me in the draw. One title that I felt was inspiring was A Thousand Splendid Suns. The visual I get is very beautiful. Great interview! A book that inspires me is Natalie Goldberg's Writing Down the Bones. Awesome. The most recent book to inspire me was "A Single Thread" by Marie Bostwick. I really enjoy the guest appearances on this blog - thanks for doing this, Wendy! It was great to get to know Michelle Richmond. I love her son's comment about the "magic nation!" A book I just finished and found very inspirational and plain wonderful is "The Art of Racing in the Rain" by Garth Stein. Looks like such a lovely read! A book title that inspired me is "Odds on Love" by Maysie Greig. Wonderful post. No need to enter me. I added your giveaway to my updated Giveaways Galore, which will be posted this weekend. Everyone - Thank you so much for sharing your inspirations with me! As we can see, inspiration comes from just about every type of book, even the least expected. The inspiration can be big or small or in between. Wherever it comes from, it's something to treasure! This book is on my nightstand, so please don't put my name in for the contest. Just wanted to say I love the way kids think and thought the 'magic nation' was so sweet. A book that inspired me is Monique and The Mango Rains. It's hard to pick just one book, but I would have to say The Last Lecture, and also The Five People You Meet In Heaven. I recently had to read The last Lecture for school and I found it very inspiring. The Last Lecture gave me a lot to think about and changed my perspective on a lot of things. I am an international entrant. There have been many books that have inspired me through the years. An inspiring book that I am currently reading is The Purpose Driven Life. Some mentioned The Last Lecture. What a concidence! My husband brought home a copy of that book this weekend and set it down on my computer desk. When I was reading the posts, I looked over and there was the book! I guess The Last Lecture will be the next book I read! Thanks for the giveaway! I am a new subscriber to your blog. this book is on my personal summer reading challenge! i am really looking forward to reading it--avisannschild suggested it! as for an inspirational book or novel...i am always inspired by lorraine hansberry's 'a raisin in the sun'. the obstacles that the younger family faces sometimes seem insurmountable, yet they are able to prevail. the play always gives me hope. Inspirational book, oh yes Shadow of the Wind by Carlos Ruiz Zafon. There are still quotes that are stuck in my head from that book. I wish i could writer like that. It was interesting to read Michelle Richmond's guest post on where ideas for stories come from. "Magic nation" is very cute! A book that inspired me... hmm.. that's hard. One that comes to mind is The Diary of a Young Girl by Anne Frank. I bought "The Whistling Season" by Ivan Doig just because the title seemed so lyrical to me. I haven't read it yet but have read another by him that I absolutely loved. I would love to win. Here's my email: shaneen at easilink dot com. Has to be Little Women. I read it at ten, and the idea that I could become a writer, and write about a family's life and it be important - changed everything for me! The Five People You Meet in Heaven was a very inspiring book. I passed it along to all of my friends. Please enter me in your giveaway. Thank you for the very interesting interview. I love reading about what inspires writers. This is wonderful and I'd love a chance to win Michelle's book. The Year of Fog was my first read of the year and I loved it. This is a tough one...When I was young Laura Engalls Wilder inspired me to want to read, and more recently Battlefield of the Mind by Joyce Meyer inspired me in a different way. Thanks for entering me! I've been madly taking down all these great inspirational books. Thank you so much everyone for dropping in! The book that inspires me most is the bible, but I will agree with one of your other post 90 minutes in heaven was pretty inspiring. Please include me in your giveaway. A book that has inspired me is A Child Called It. It is so powerful. Thank you all for entering! The winners will be announced shortly.